Open Exchange Administrative Console in Internet Explorer → Navigate to "Compliance management"→ Click on "Auditing" → Select "Run the admin audit log report". To see all configuration changes made during the specified period, fill out the start date and the end date fields → Click "Search". Sort the list by cmdlet and find the "Add-MailboxPermission" cmdlet → Click on it for details. To find out who changed permissions, refer to the "User" section. 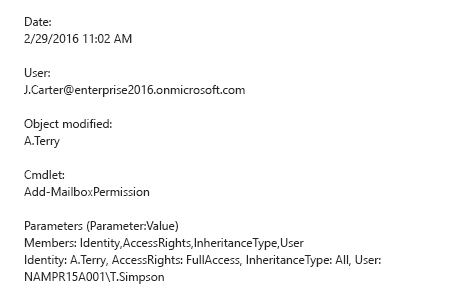 To find out which mailbox permissions were changed and how, refer to the "Parameters" section. Click the "Search" button and review what changes were made to access rights. Anyone who gets mailbox permissions in Exchange Online gains access to all the contents of that mailbox. They can read messages, change or delete items, move content to another location, distribute it and more — without the mailbox owner even being aware of these actions. Therefore, to protect sensitive mailbox content and prevent data leakage, organizations need to continuously monitor mailbox permission changes and be able to quickly determine what permissions were modified and by whom. 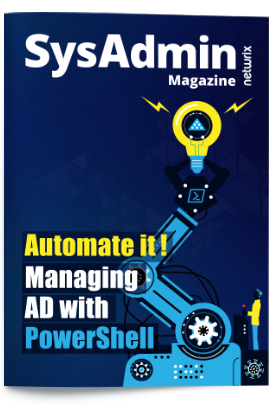 Netwrix Auditor for Office 365 delivers complete visibility into hybrid cloud IT environments, including mailbox permission changes and data access in on-premises Exchange and Exchange Online. The solution informs about every Exchange Online change, improving Office 365 email security. 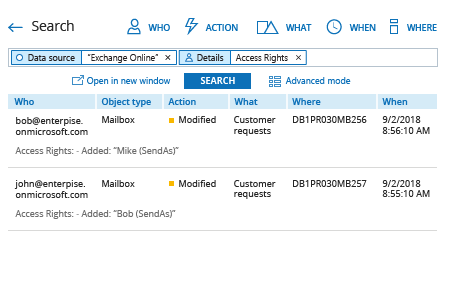 With Netwrix Auditor Interactive Search feature, IT pros can determine in minutes which mailbox permissions were modified, who set new mailbox permissions, and when each change happened — mitigating the risk of data leaks.